I will start with the article entitled “The evolution of the meme” by Kevin Laland and John Odling-Smee. I want to show that Kevin Laland and John Odling-Smee misunderstand the concept of meme and, more precisely, the concept of replicator altogether, which as a result discredits somewhat the point they are trying to make in their article. What determines whether a meme will spread? 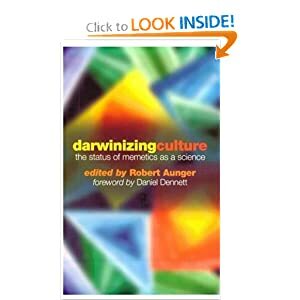 For Dawkins (1976), memes, like all replicators, spread if they have fidelity, fecundity and longevity. In memetic discussions, each of these properties is usually treated as if it is an intrinsic characteristic of the meme. [...] studies of social learning in species as diverse as rats, pigeons and guppies suggest that these animals sometimes adopt a “do-what-the-majority-do” strategy (Laland et al. 1996B). In such cases, the probability that an individual will adopt a meme depends not on its infectiousness, but on the number of individuals already expressing the behaviour. Again, if a meme, or any replicator, fails to be copied it is precisely because it has lost its infectiousness, and it has lost it because the environment has changed, suddenly turning what previously was a successful replicator, into a non replicator. This is maybe the point that K. Laland and J. Odling-Smee have missed. It is the relationship between the environment and the replicator that defines a replicator. If the environment changes the very nature of the replicators is to be re-examined. This issue obviously casts a shadow on their overall argument of niche construction which otherwise is full of interesting insights on evolutionary processes and most certainly worth a read.